Affordable family oriented tablet from Lenovo featuring a 7-inch HD display with Dolby Atmos front-facing speaker, Android 7 Nougat OS, 5 MP main / 2 MP front camera, and an estimated 15 hours of battery usage. The lowest price of Lenovo Tab 7 is P5,199 at Lazada, which is 31% less than the cost of Tab 7 at otcer, Lazada and villman (P7,550). The latest price of Lenovo Tab 7 was updated on Apr 15, 2019, 09:18. The Tab 7 is an entry-level Android tablet from Chinese multinational electronics company Lenovo. Released in November 2017, the Lenovo Tab 7 measures 7.6 inches in length, 3.89 inches in height, and 0.33 inches in width. It is lightweight at only 260 grams. As with many entry-level tablets, the tablet is made of plastic material, but it does not carry an inexpensive look. The device has a power button and volume controls on the right side. The Tab 7 sports a seven-inch IPS LCD capacitive touch screen, with a 70.9 percent screen-to-body ratio. It has a 720 x 1280-pixel resolution and a 16:9 aspect ratio. A 1.3 GHz quadcore Cortex-A53 central processing unit (CPU) based on Mediatek MT8161 chipset powers the device, while a Mali-T720MP2 graphics processing unit (GPU) addresses its graphics requirements. It runs on 1GB of random access memory (RAM). It does not come with a memory card slot, so users will have to make do with the 16GB internal storage that comes with the tablet. With such hardware specs, the device may be used to run simple apps without issues, but it struggles when it comes to multitasking. When surfing the Internet, lag may be encountered especially when several tabs are open. Switching from one app to another also causes some delay. Lenovo makes up for the Tab 7's mediocre hardware specs through a relatively well-liked operating system. The gadget comes with Android 7 Nougat out of the box; hence, users can enjoy the standard features from this OS, including the split screen view. This tablet packs a five-megapixel rear camera with LED flash and a two-megapixel front-facing camera to satisfy the user's selfie requirements. One may be surprised to find out that the selfie camera packs more pixels than the main shooter. It also has usable video capabilities. The Tab 7 boasts of an audio system that has Dolby Atmos audio enhancement feature, which is a nice treat. It has a loudspeaker and a 3.5mm jack as well. The gadget supports Wi-Fi but limited to the 802.11 b/g/n standard. It also has Bluetooth, Global Positioning System, and microUSB 2.0 connectivity options. It is also equipped with an accelerometer. The Tab 7 uses a non-removable 3,500 mAh battery, which is not generous but seems adequate given the device's low hardware specs and screen resolution. It is available in Slate Black and White color variants. 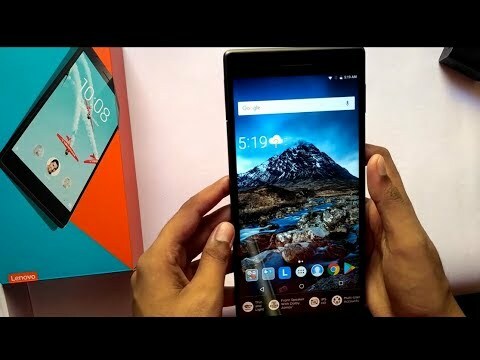 Is the Lenovo Tab 7 it a good find? Lenovo introduced the Tab 7 as an entry-level tablet along with the less expensive Tab 7 Essential. It is targeted at casual users who need not run complex applications on the device. With a sub-$100 price tag, do not expect premium-grade specs and features from this tablet, but it is adequate for running social media activity and simple tasks such as reading or media viewing.